The spirit of innovation and competition is one of the driving factors for Topcoder. Innovation moves the world forward. Significant problems can be tackled. The world made a better place, and amazing things done. Competition can frequently fuel those innovations and is one of the cornerstones that Topcoder is built on. We love the Topcoder community and the communities we live, work and serve. Mike Morris our GM, crowdsourcing guru and one of the leaders at Topcoder often helps our customers innovate and feels strongly about improving our collective communities. Mike feels strongly about supporting the next generation of young inventors. 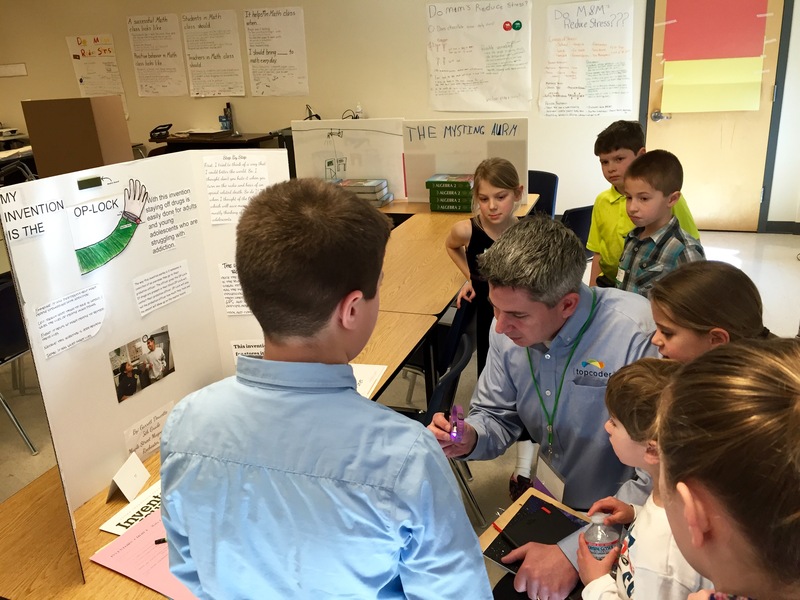 Young inventors are often unrecognized pioneers in the field of innovation and invention. Take for example young Louis Braille, who at the age of only 15 years old in 1824 developed the ingenious system of reading and writing utilizing raised dots. Those dots would go on to be called Braille and become the standard form of writing and reading used by blind people to this day. Alternatively, the story of a 14-year-old who had the idea on his father’s farm at the age of 14 in Idaho. That young man Philo Farnsworth realized electron beams could scan a picture in horizontal lines and thus reproduce the image. That key factor would be a significant and critical breakthrough in the invention of electronic television. Encouraging young inventors to innovate is an important aspect of the creation of an entire generation who will go on to do great and amazing things. Topcoder understands this importance and recently sponsored an elementary school in our neighborhood with over 150 kits that brought access to science, technology, engineering and mathematics resources to students. STEM is an important aspect of the educational process. Mike not only helped facilitate the gift and sponsorship but also was a judge for the regional Young Investors Conference and the Topcoder Disruptive Technologies Award. Disruptive technologies (the much-needed heart of innovation) displace something legacy, for new and improved ways of doing things. That innovative spirit fuels the Topcoder Disruptive Technology Award, which honors inventions sure to turn their respective industries upside down and inside out for the better! Topcoder continues to support innovation and invention in our Topcoder Community and in the communities we call home – Congrats to the winners!